A fragment of a battle scene painted in gouache on paper. To the left of the painting is part of a wall with a balustrade from which two archers are drawing their bows ready to fire arrows at the enemy. A bearded figure on horseback, his lower half obscured slightly by the wall, wields a sword in his right hand and shield in the left. He is either about to attack or has just killed his opponent, whose body is bent backwards as if he is wounded or ready to throw the lance. In the centre of the painting another figure aims his lance at a soldier with a round shield and wide sword. The majority of works on paper discovered at Fustat are Fatimid and when this painting was acquired by the British Museum it was assumed that the painting was a Fatimid work. However, certain details suggest a later date, such as the kite-shaped shields, a type introduced by the Normans that was not in use in Egypt until the end of the AH 7th/ AD 13th century. 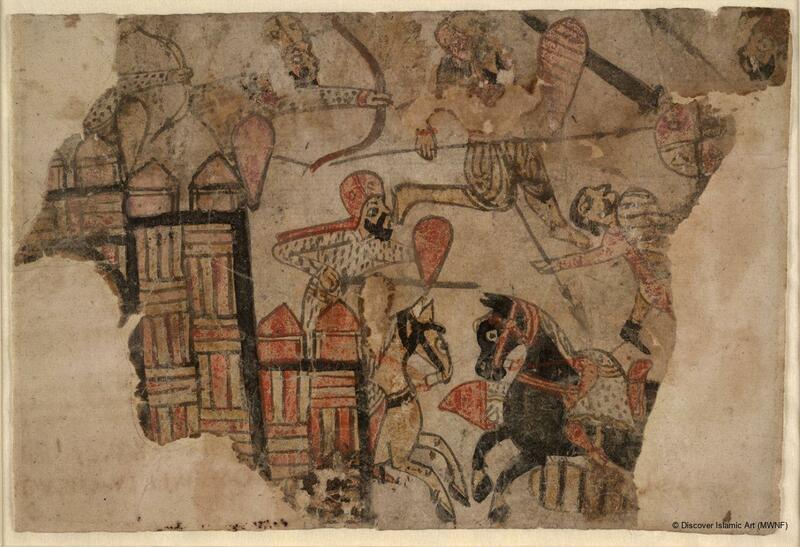 A fragment of a gouache painting of a battle scene, from Fustat, Cairo. One of a small number of surviving paintings from the medieval period. The date of this painting is not certain; it is either Fatimid, like many other works on paper excavated at Fustat, or Ayyubid from the AH 7th / AD 13th century. This painting was previously thought by scholars to date to the Fatimid period, but recent research dates it later to the Ayyubid period, due to the headgear worn by the figures on the left that resembles 7th- / 13th-century illustrated manuscripts produced in Syria, and the figure on the upper right who has a kite-shaped shield, a Norman design not used in Egypt until the end of the 7th / 13th century. The painting was found in an excavation at Fustat, Cairo. Contadini, A., Fatimid Art at the Victoria and Albert Museum, London, 1998, p.13. Gray, B., "A Fatimid Drawing", British Museum Quarterly, XII, 1938, p.91–6. L'Orient de Saladin au temps des Ayyoubides, exhibition catalogue, Paris, 2001, p.94, cat. no. 62. Emily Shovelton is a historian of Islamic art. She studied history of art at Edinburgh University before completing an MA in Islamic and Indian art at the School of Oriental and African Studies (SOAS) in London. Since graduating she has worked on a number of projects at the British Museum. Other recent work includes editing and writing for a digital database of architectural photographs at the British Library. She is currently working on a Ph.D. on “Sultanate Painting in 15th-century India and its relationship to Persian, Mamluk and Indian Painting”, to be completed at SOAS in 2006. A paper on Sultanate painting given at the Conference of European Association of South Asian Archaeologists, held in the British Museum in July 2005, is due to be published next year.